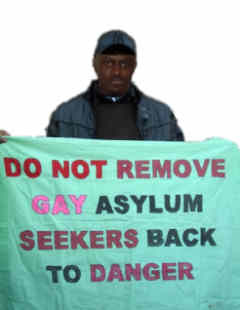 LGBT Asylum News: Video: Is Homosexuality un-African? On March 12 the BBC World Service broadcast a debate from South Africa: 'Is Homosexuality un-African?' The debate drew protests at its venue due to the inclusion of Ugandan MP David Bahati, author of the 'Kill the gays' bill. It's title was also protested in the UK. Festus Mogae, former President of Botswana, was another panelist. He has spoken in favour of decriminalisation. Other panelists were South African writer Eusebius McKaiser and Paula Akugizibwe, regional treatment advocacy coordinator at AIDS and Rights Alliance for Southern Africa. The video of the debate has now been posted online. BBC World Debate: Is Homosexuality un-African? from Ben Cashdan on Vimeo. The BBC programme was debated at the Frontline Club in London March 10 by a panel chaired by Ben Cashdan, producer of the BBC debate, which included gay Ugandan John Bosco Nyombi and Jonathan Cooper, CE of Human Dignity Trust. I really hate this thought going around saying that we are UNAFRICAN, yet it is widely known that before much of the colonization of many african countries, homosexuality was commonplace in many tribes.